Eugen, OR - His Grace Bishop Maxim visited the parish of St. John the Wonderworker Serbian Orthodox Church in Eugene, Oregon on Sunday, November 11th, bringing Professor Christos Yannaras with him during his archpastoral visit. This was Professor Yannaras’s first visit to Eugene, Oregon, and the faithful were treated to a contemplative talk and insightful question and answer session following the Hierarchical Liturgy and banquet. The morning began with the faithful of the community from St. John’s, as well as those of its sister churches St. Stephen Serbian Orthodox Church (Milwaukie, Oregon) and St. Martin the Merciful Russian Orthodox Church (Corvallis, Oregon) gathering at the gate to welcome the bishop. With bells, singing, and loving joy the bishop was greeted on his return to Eugene. 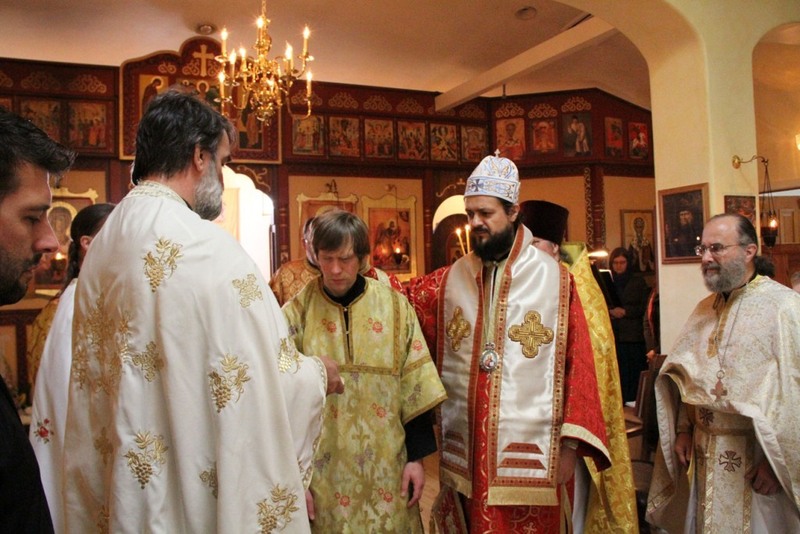 Preceding the Liturgy, Bishop Maxim tonsured Professor Alexander Polishchuk a reader. Professor Polishchuk is a mathematics professor of the University of Oregon and has faithfully served as St. John’s choir director for six years. He is the husband of Dr. Maria Nemirovskaya, the president of St. John’s Executive Board. They are the parents of three children. The parish rejoiced to witness the solemn tonsuring and prayers of the Bishop for its new reader. Concelebrating with Bishop Maxim were Protopresbyter David Lubliner, Protopresbyter Nikola Todorovic (St. Stephen’s, Milwaukie), Priest James Baglien (St. Martin the Merciful, Corvallis), Priest Daniel Mackay, and Deacon Stephen Dyer. After a celebratory banquet welcoming the Bishop and the Professor, Yannaras spoke to those gathered. The worship space of the church’s nave was transformed from a place of offering and prayer to a “level plain” where the teacher could seat instructing those gathered in love and warmth that was apparent to all. His opening remarks were directed toward the situation in this country, where we can observe that the Orthodox Christian Church is different from the rest of the “churches,” who also speak about family and communion. He notes that when someone, such as himself, comes to the States from another continent, what impresses one is the large number of churches. If everyone uses the term “church,” how can one know that the Orthodox Church is truly different? What is the true reality that establishes the Church? The answer that Professor Yannaras offered is that the true Church safeguards the experience of the Truth. It is not an ideology or administrative reality, but it is a mode of existence that is revealed as freedom from any necessity. Christ is God freed of his Divinity, which is why He could assume human nature. For us, He is God because He is Father, Son, and Holy Spirit. He is not God because He is predetermined to be God like we are predetermined to be humans. The remarkable Truth that the Professor here revealed is that God is what He is because He loves. In this love we are freed from individuality, which separates. How familiar are we Americans with the celebration of individuality? When this individuality approaches the Body of Christ, it is our ego that seeks to fulfill requirements that reduces the Church to an ideology to which one can adhere. Yet, our life should become a participation in communion, wherein we assume life as relationship by taking Bread and Wine not in order to survive, but to be in communion with the Bestower of Life and with our brethren. To the Lord, the repentant Thief exclaimed, “Please remember me in Thy Kingdom.” Christ didn’t say, Professor Yannaras reflects, “first you should do some good deeds and then I will receive you.” His answer was, “Today you will be with me.” It is the love of the Church that saves us. Strengthened and emboldened by this love. The faithful continued in fellowship throughout the day, rejoicing in their bonds of love strengthened in Christ.